If you are looking for a bit of heavenly peace, I have found the place for you. 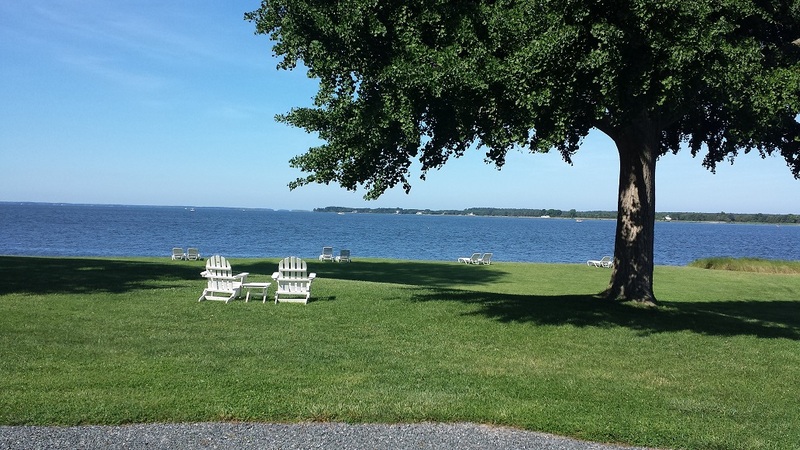 SANDAWAY WATERFRONT LODGING is a quaint Bed & Breakfast located literally yards from the Chesapeake Bay. Each unique room, suite or cottage is decorated with a mixture of antique furniture and modern accommodations. Four-legged tubs, roll-top desks, four-poster beds and stenciled wood complement free Wi-Fi, plenty of outlets, and flat screen televisions. Boasting its own sandy beach, most rooms have a waterfront view and all have private screened-in porches. Complimentary coffee/tea and snacks are available 24 hours in both the library sitting room and the separate beach house. A basket with fresh baked goods, fruit, beverages and other breakfast items is delivered to your door each morning. In the tiny gift shop, you can pick up toiletries, souvenirs, a set of the luxury sheets used by the Inn, and even a CD of 50’s music recorded by owner Kenny Gibson. The Innkeepers really don’t know how to do things wrong here. All your needs are met, and if you come up with something special, they will try to accommodate you. As for activities, you can sit in the Adirondack chairs or chase lounges and watch the boats sail by or you can visit the historic town of Oxford. For a special treat there’s a ferry that takes you over to St. Michaels, a slightly more tourist-y town but full of old-world charm. But there is definitely another option – SANDAWAY WATERFRONT LODGING makes doing nothing totally delightful. and surprises around every corner. Known to most of us as "Motor City"
the wonders of Detroit, you can head right across the river to Windsor, Canada. full of discounts and bargains that will stretch your vacation dollar. indoor pool, solarium, exercise room, sauna, Web/Cable TV, and a business center. costumes of the music that created a revolution. a birth certificate will be requested for entry. hooded bay window that has been the scene for many a patron's special event. mysterious Victorian Strawberries dessert and try to guess the secret ingredient. stay at the full-service Holiday Inn Select (1-800-HOLIDAY or www.holiday-inn.com). facilities are available, and best of all, your winnings in Canada are tax free. (or a ball and pineapple come New Year's Eve). available for meetings, conferences, and special events. you have had a cup of their coffee - some of the best we've ever had! entertainment that folks are often forced to dance on the sidewalks. meeting spaces are available at this facility. coffee each morning make the Seagate a favorite of return visitors. view of the ocean assure that your meal will be a special experience. sure to find at least one "must have" at their gift shop. experiences make for a fun and interesting adventure. gift shop full of crystals, aromas, books, candles and jewelry. popular, this continental-cuisine restaurant is famous for its martinis. We're told there's even a chocolate one! town business takes place here in its casual atmosphere. perspective, and an eye to the future. delightful vacation experience, and a powerful incentive to return. nightlife, and ecotourism opportunities galore. April through December is Value Season in Palm Beach County. ESCAPE provides the perfect justification. way to eliminate the winter doldrums! The setting for this event is sublime. gracious hospitality and plenty of pampering. million worth of furnishings and art. tennis, watersports, and a fitness center. want to leave this idyllic resort. vintners were available to pour their wines. prepared by Chef de Cuisine Thomas Oden. perfectly topped off a distinguished day. Traci Des Jardins, and Charles Saunders. the Past for the Future," was grand indeed. No need to despair if you missed this event. more unforgettable are already in the works. Garry Sowerby (we'll talk about this extraordinary man later) decides to design the American Dream Vacation. He gathers ten fearless couples from all over the world and sets them off on an adventure that will last a lifetime. press along the way, and let the adventure begin! Teams met in Birmingham, Michigan, to pick up their 1996 Oldsmobile Auroras and learn the First Leg of their vacation. Given only the destination and adventure stops along the way, participants armed with road atlases and Polaroid and Kodak cameras took off. To document their escapades and misadventures, log books were kept. Along the way teams were given challenges, such as finding the tackiest souvenir and the best road meal (much of the fun came from explaining the meaning of "tacky" and "road meal"). The goal was to "out- vacation" each other while seeing as much of the American West as possible. The Superhighway Connection: All you needed were a computer and a modem to join in the fun. Sowerby's Website documented each step of the journey, and websurfers were encouraged to participate by routing for their favorite team and providing advice, tips, and strategies. Garry and Associates provided daily updates, many from the teams' log books, so you can get a real taste of the event. The 1996 Oldsmobile Aurora is an awe-inspiring vehicle. The 32-valve, 250hp DOHC V-8 can (and did) easily go from 0-60 in a mere 8.2 seconds. Kongar-ool from Team Tuva felt the car should be equipped with a parachute, and Team Turkey and Team Reunion can attest to its speed (they have the tickets to prove it). Sleekly designed inside and out and fully loaded with luxury features, the Aurora attracts attention wherever it goes. Whenever I left my husband with the car, I would return to a group of strangers standing around the open hood and trunk marveling at its many wonders. The Auroras headed out to The White Gull Inn in Fish Creek, Wisconsin; this was the first of many rendezvous where the teams shared their experiences. Days spent on the road create hilarious incidents, challenging ordeals, and an awareness of the American culture that beg to be recounted. From Fish Creek, it was on to the Paradise Dude Ranch in Buffalo, Wyoming, and then to the North Rim of the Grand Canyon in Arizona. From here the elegant Phoenician Resort in Scottsdale, Arizona, was awaiting the travelers. The lavish San Ysidro Ranch in Montecito, California, was the next stop, and the final leg ended up in the renowned Beverly Hills Hotel. At a press conference in Beverly Hills the teams gathered for their final day of the AURORA VACATION CHALLENGE. Log books were on display, awards were bestowed on each team for their distinguishing qualities, experiences and impressions were shared with the media, Kongar-ool rendered an amazing performance of throat singing, and sadly everyone began preparing to return home. Some of the log books were as much as five inches thick, and even the teams that put them together would be hard-pressed to verbalize their experiences. Anyone doubting the possibility of world peace should have been a part of this challenge. Almost immediately these teams bonded, became a part of a new and unique family, and will most assuredly maintain contact with each other for many years to come. Traveling through a foreign country, spotting an Aurora in the distance, and coming across a friendly face has to be a remarkable and welcome surprise. Team Reunion felt so comfortable with the group that they slipped away to Las Vegas to get married and celebrated with their new-found friends at a rendezvous dinner. Throughout the challenge these atypical comrades discovered a new culture and conquered obstacles together. And Americans along for the madcap ride had an opportunity to see their country from the innocent eyes of visitors. Each team became Ambassadors of Good Will as they encountered friendly strangers and explained their mission. Cowboys in Wyoming were awe-struck as they watched the Tuvan throat singer perform; Team Poland spent the night in their car and were cheerfully rescued by local police the next day; and the stories go on and on. There were no losers in the AURORA VACATION CHALLENGE; everyone came away inspired and enriched. Fuego, Argentina to Prudhoe Bay, Alaska. not the first vacation challenge for Sowerby. Last year he did the same thing in Europe with 8 American couples and 2 Canadian couples, but the 1995 AURORA VACATION CHALLENGE shows the true genius of the man.Taking ten couples from different countries on a journey from the majestic mountains of Wyoming to the affluent sophistication of Beverly Hills and letting them do it in a 1996 Aurora so they can experience the taste of freedom for which America is celebrated was nothing short of genius.Making it fun and safe and successful is mindboggling and miraculous. I came away from the AURORA VACATION CHALLENGE with a course of action. I am periodically checking Garry's Website; I am reading every book he wrote (Road Fever and The Great Gold Toothpick Caper are two that I'm aware of); and whenever I hear the name Sowerby, I am paying attention. This is one fun dude!